This peak is #52 on the Height List for Alberta . 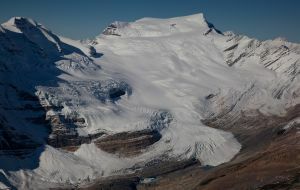 This peak is #5 in Prominence List for Alberta .Mount Chown lies north of Mount Robson, on the south arm of the Resthaven Icefield. It is at the head of the Jackpine River Valley. It is on the border of Jasper & Willmore Parks, Alberta. Its southern flank is drained by a long glacier going into Chown Creek and the Smoky River. The peak is within 1 km of the continental divide. It is one of the highest peaks in the area. It can be skied almost to the summit. Name Notes: Mount Chown was named for Samuel Dwight Chown (1853-1933) of Winnipeg, Manitoba, a general superintendent of the Methodist Church, and one of the founders of the United Church of Canada. The United Church was formed in 1912 due to the needs of hundreds of small prairie towns where it was impractical to have 3 or 4 separate churches. When the Congregational, Presbyterian and Methodist Churches in Canada decided to unite in 1925, the Methodists were the largest denomination and Dr. Samuel Chown was President of the Methodist Conference in Canada. Recognizing the painful struggle that the Presbyterians had with union and realizing that if this new church, this United Church of Canada was to get off on the proper footing, a unique gesture was needed. As the leader of the largest denomination, everyone believed that Dr. Samuel Chown would be the first Moderator of the new United Church, but when the General Council Dr. Chown stood up, removed his name from the ballot, and suggested the name of the Presbyterian Moderator, Dr. George Pidgeon. There was stunned silence - then realization of Samuel Chown's gracious act - then thunderous applause for such a gracious beginning. The peak was named by H.A. Stevens in 1912.